The National Assembly (Hungarian: Országgyűlés; “Country Assembly”) is the parliament of Hungary. The unicameral body consists of 199 (was 386 between 1990 and 2014) members elected to 4-year terms. 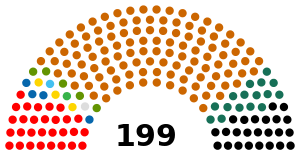 Election of members is based on a complex system involving both area and list election; parties must win at least 5% of the popular vote in order to enter the list of members of the assembly (but area winners enter regardless). The Assembly includes 25 standing committees to debate and report on introduced bills and to supervise the activities of the ministers. The Constitutional Court of Hungary has the right to challenge legislation on the grounds of constitutionality. 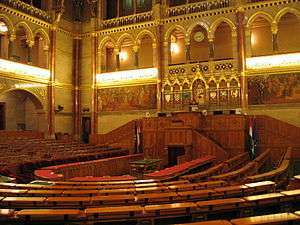 The assembly has met in the Hungarian Parliament Building in Budapest since 1902. The Diet of Hungary (Hungarian: Országgyűlés) was a legislative institution in the medieval kingdom of Hungary from the 1290s, and in its successor states, Royal Hungary and the Habsburg kingdom of Hungary throughout the Early Modern period. The name of the legislative body was originally "Parlamentum" during the Middle Ages, the "Diet" expression gained mostly in the Early Modern period. It convened at regular intervals with interruptions during the period of 1527 to 1918, and again until 1946. The democratic character of the Hungarian parliament was reestablished with the fall of the Iron Curtain and the end of communist dictatorship in 1989. Today's parliament is still called Országgyűlés just like in royal times, but in order to differentiate between the historical royal diet is referred to as "National Assembly" now. At the sixth parliamentary elections, four parties or party alliances passed the minimum threshold: the Fidesz – Hungarian Civic Union in alliance with the Christian Democratic People's Party (KDNP) (263 seats in common, 227 for Fidesz and 36 for KDNP). Fidesz-KDNP candidates won enough seats to achieve a two-thirds majority required to modify major laws and the country's constitution. The Hungarian Socialist Party (MSZP) won 59 seats, while its former coalition party Alliance of Free Democrats (SZDSZ) failed to win any seats and became extra-parliamentary after 20 years. There were two newcomers to the Országgyűlés: Jobbik (47 seats) and Politics Can Be Different (LMP) (16 seats). 1 independent (former Fidesz member Oszkár Molnár) got into the Parliament, winning a constituency (Edelény) in Borsod-Abaúj-Zemplén County. The other prestigious party, the Hungarian Democratic Forum also lost all its seats. The new parliamentary session hold the inaugural session on 14 May 2010. The President of Fidesz and Prime Minister is Viktor Orbán. Pál Schmitt served as Speaker of the National Assembly until August 2010 when he became President of Hungary. He was replaced by László Kövér. After the 2010 local elections, held on the 3rd of October, Katalin Szili founded the Social Union and became its first chairperson. As a result, she quit the Hungarian Socialist Party and their parliamentarian group. Continuing the parliamentarian work as formally independent MP. At parliamentary elections in 2006, four parties or party alliances passed the minimum threshold: the Hungarian Socialist Party (MSZP) (190 seats), the coalition party Alliance of Free Democrats (SZDSZ) (20 seats), the Fidesz – Hungarian Civic Union in alliance with the Christian Democratic People's Party (KDNP) (164 seats in common, 141 for Fidesz and 23 for KDNP), and the Hungarian Democratic Forum (MDF) (11 seats) and 1 independent (István Gyenesei) got into the Parliament, winning a constituency in Somogy county. SZDSZ: Gábor Kuncze (2006–2007), Mátyás Eörsi (2007), János Kóka (2007–2010). MDF: Károly Herényi (2006–2009). The faction of MDF broke up in 2009. The head of the allied faction Fidesz-KDNP was Viktor Orbán. The head of the minority government (since 2008, when SZDSZ left the coalition) was Prime Minister Ferenc Gyurcsány then Gordon Bajnai. The speaker of the Assembly was Katalin Szili (2006-2009) then Béla Katona (2009-2010) of the MSZP.